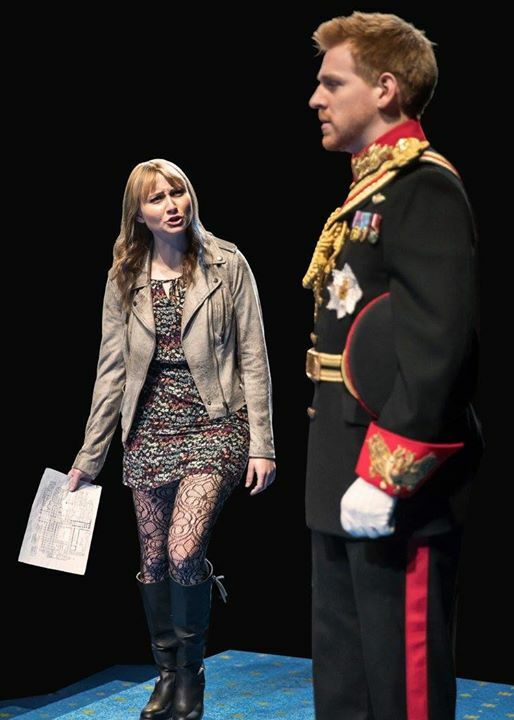 Chicago Shakespeare Theater presents KING CHARLES III. I recently completed Netflix’s The Crown. It chronicled the beginnings of Queen Elizabeth II’s reign. I finished the series wanting to know more. 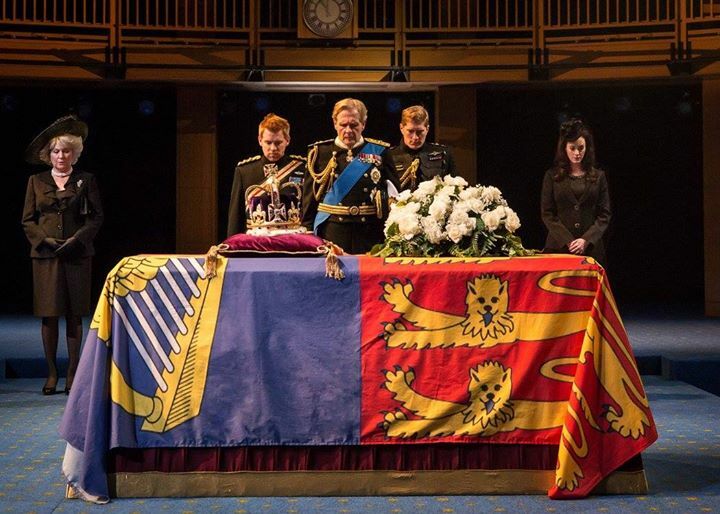 KING CHARLES III is the perfect sequel. Playwright Mike Bartlett imagines the time period directly following the death of QE2. It’s set in contemporary times. The Royals’ situation is the familiar. In the limelight are the popular William (Jordan Dean) and Kate (Amanda Drinkall) and bad boy Harry (Alec Manley Wilson). 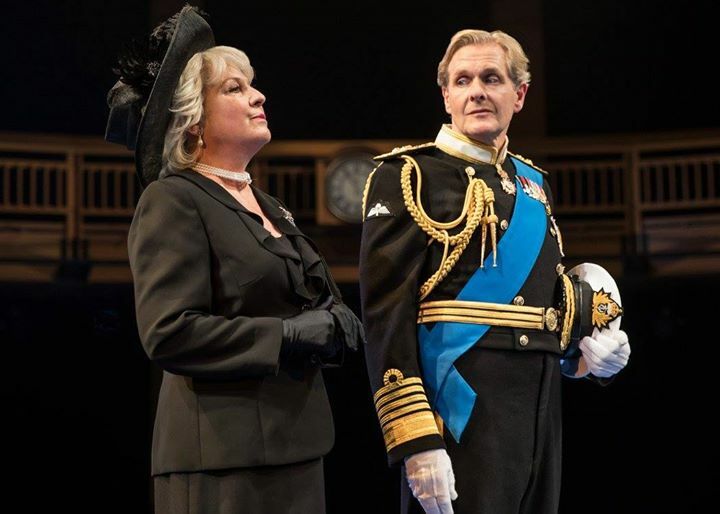 In the corner, the dusty Prince Charles (Robert Bathurst) and disliked Camilla (Kate Skinner). The show starts with the funeral. The family gives an unemotional sendoff to the matriarch monarch. Following the regal ceremony, each has his/her own agenda. The dutiful Dean and strategic Drinkall are ready to give comfort to the public. Wilson wants to go drinking. And Bathurst is ready to make history. Bartlett cleverly conceives what might happen for a Prince who finally takes over the ‘family business’ after decades of being in his mother’s shadow. Instead of assuming the role of sovereign facade, Bathurst decides to insert his personal beliefs. On his very first task to sign-off on restricting the press’ access, Bathurst requests parliament to reconsider. The defiant act escalates to absurd heights as the Royal Family and the government struggle for power. 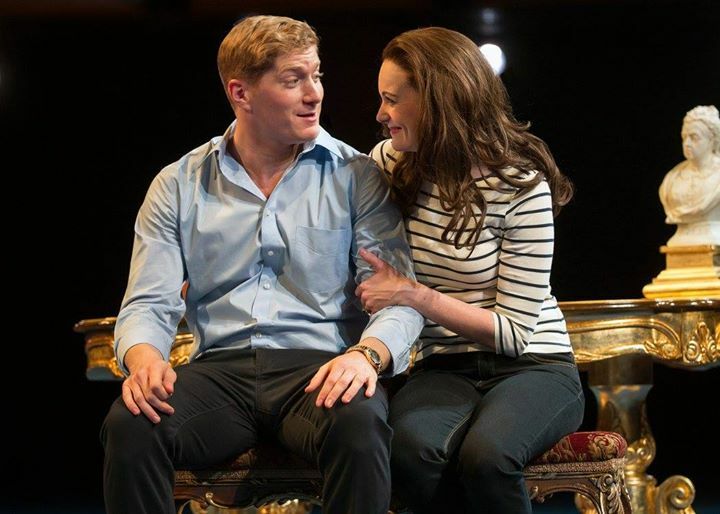 Bartlett won the 2015 Olivier Award for Best New Play. His story, pre-Brexit and pre-Trump, probably was received as more of a lampoon. In the aftermath of huge change for the UK and USA, the play has somber undertones. What happens when one person goes against established protocols for his own self interests? Under the masterful direction of Gary Griffin, the pace is tight. Bartlett has intertwined the modern situation with Shakespearean-stye verse. Griffin’s talented ensemble authentically deliver their rhythmic lines. Drinkall, in particular, regularly begins a wifely manipulation with a lyrical ‘my husband.’ The address sounds more affectionate than forced stuffy. She speaks in verse while wearing jeans to push Dean towards The Crown. The engrossing moment is a blend of past, present and future. This play is about roles and relationships. Each character grapples with duty verses desire. Bathurst’s dreams of being king had been delayed by the longevity of his mother. He longs to rule with thoughtful purpose. He has done his duty. Now, he wants what he wants. All his life, Wilson has been burdened by the duty of being the spare and not the heir. He yearns for an ordinary life with his new-found and working-class love (Rae Gray). On the other hand, Dean and Drinkall desire the duty. An earnest Dean embraces his place in the monarch line. The determined Drinkall is committed to her marriage to both husband and country. I thoroughly enjoyed KING CHARLES III. It illustrates the Royals in a personable yet untouchable way. When Bathurst utters ‘I don’t want to be alone’, the weightiness of the moment is consuming. He’s proud and desperate and angry and vulnerable and King. The glimpse at the humanity behind the Crown is fascinating. KING CHARLES III is a regal behind-the-throne musing. The exploration of the British kerfuffle is a nice, short escape from our American calamity. Running time: 2 hours and thirty minutes includes an intermission.